The DJ circuit is down one certified legend after the genre-hopping Zed Bias announced he is hanging up his headphones. With 20 years under his belt, there's no question that the man with a thousand pseudonyms has been one of the key players in the development of underground music as we know it, his inimitable influence and fearsome talents extending into every shadowy corner of the club scene. Operating variously as Zed Bias, Maddslinky, Phuturistix, Henchmen, Daluq, Talissman, Ruffcut Bias, Nu Design, 7 Wonders, Dekata Project and Strontium Dog, Dave Jones is a true musical innovator. Starting out in the realms of drum & bass and breakbeat, he soon transformed himself into Zed Bias to ride the crest of the crashing UK garage wave - his tune 'Neighbourhood', featuring Nicky Prince and MC Rumpus is an anthem of the genre. Never one to kick his heels, Jones promptly reinvented himself again, this time sliding neatly into the nebulous dubstep scene - before long, Maddslinky was widely regarded as a 'godfather' of the genre, with Skream citing the album 'Make Your Piece' as a highly influential record in the rise of dubstep. Maddslinky kept moving with the times, and with genre-twisting release like 'Compuphonic' slotted in nicely with the Swamp81 camp. We're delighted to announce that Zed Bias will be joining us for the Faded x Brickworks official Detonate Festival afterparty, one of his last shows before he hangs up his headphones. It's not going to be one to miss. 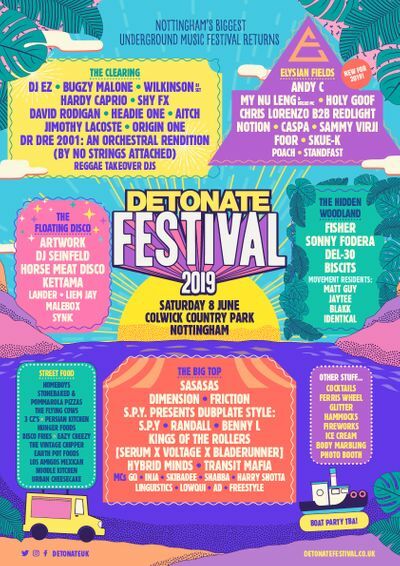 Click HERE for the Detonate Festival event page.